Boiler bands. Head and shoulders. Death cross. Cup and handle. These are some of the terms associated with technical analysis. 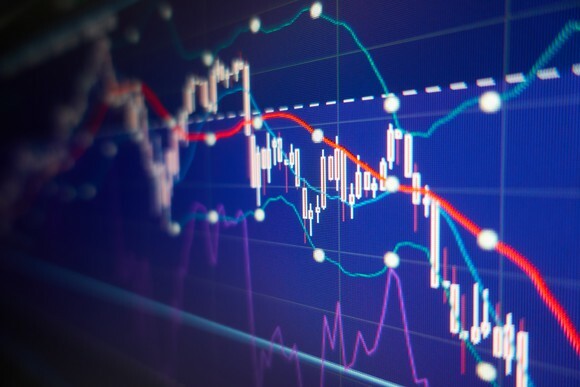 The idea behind this "investing" style is that pricing patterns repeat themselves, and decisions can be made by looking at a stock's price movement and trading volume. I've never believed in technical analysis. My Motley Fool colleague Anand Chokkavelu pointed out years ago that the evidence against technical analysis is extremely strong. He highlighted a 2009 study by Massey University in New Zealand that tested more than 5,000 technical analysis strategies. The study showed that no strategy generated returns that aren't predicted by chance. That data helped to confirm my suspicion that almost all technical analysis chart patterns are useless. However, that doesn't mean that all charts are useless. I'm a firm believer that winners tend to keep on winning. One of the first things I look at when I'm researching a stock is how it has performed versus the market over time. My primary yardstick is to compare a stock with the S&P 500 over the last five years, but I also check how the company has performed since its IPO. If it has walloped the market, then I get interested. If it has lost badly, then I usually write it off. If you want to see what a wonderful long-term chart looks like, consider Mastercard (NYSE: MA). The payment processing giant has thrashed the index over the last five years. Conversely, MannKind, which is a struggling commercial-stage biopharma, has a five-year chart that is about as ugly as it gets. 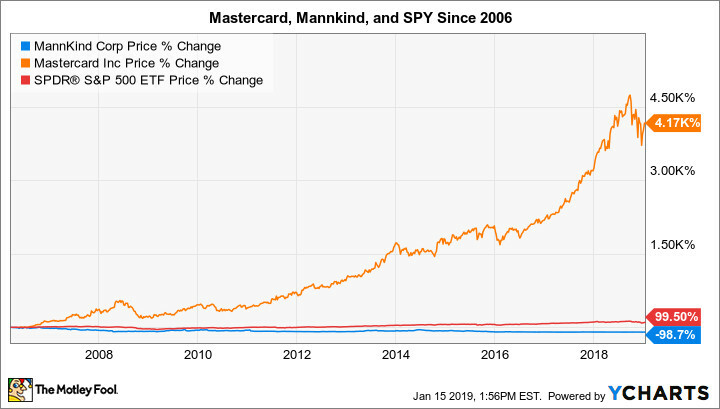 The numbers diverge even more when we start from Mastercard's IPO in 2006. 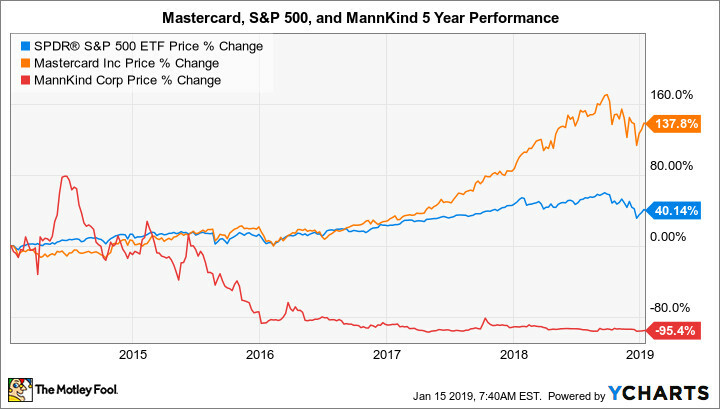 This chart shows that Mastercard has done a phenomenal job of rewarding long-term shareholders. By contrast, MannKind's total loss of 99% couldn't be much worse. I like to invest in companies that post consistent revenue growth. When a company can do so for years on end, it tells me that the business is successfully riding a long-term trend and that it is not dependent on outside forces for success. Let's compare two well-known stocks to hammer this point home: streaming kingpin Netflix (NASDAQ: NFLX) and energy giant ExxonMobil. Both companies have thumped the market since they went public and have been spectacular long-term investments. Netflix's revenue consistently moves higher every year. This 15-year time window includes the 2008 recession and the company's Qwikster debacle. I find the company's consistent revenue growth to be highly appealing. By contrast, ExxonMobil's revenue fluctuates wildly from year to year. When energy prices are high, the company's revenue soars. When prices fall, its top line tanks. This chart makes one thing clear to me: ExxonMobil is heavily dependent on an outside force -- the price of oil -- for its success. By contrast, Netflix appears to be in complete control of its top line. 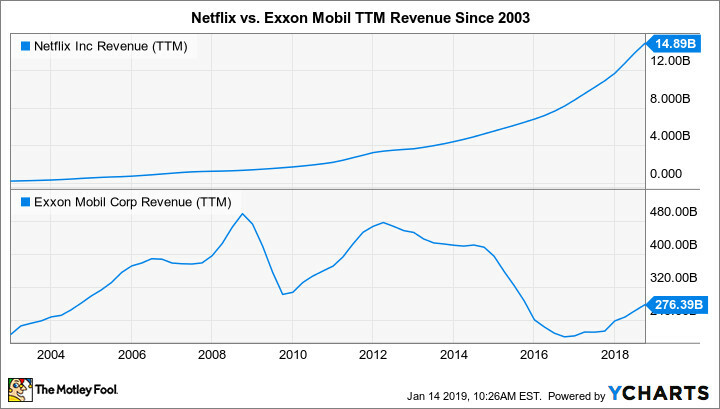 This is a big reason why Netflix is a major part of my portfolio and ExxonMobil is not. The best growth companies take advantage of their increasing scale by spreading their fixed costs over a larger base of customers. 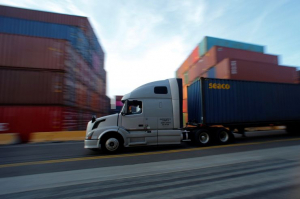 This helps drive operating leverage and can lead to outsized growth on the bottom line. This is why I always look at a company's gross, operating, and profit margins over time. If they are holding steady or increasing, then it is a great sign for investors. If they trend downward, then it suggests that all of the value creation is being captured by the company's customers or suppliers and not by investors. 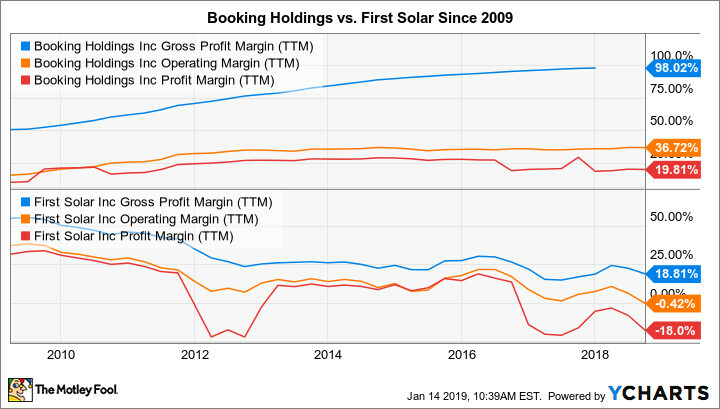 A 10-year chart that compares travel giant Booking Holdings (NASDAQ: BKNG) to solar panel maker First Solar showcases this point beautifully. Both companies are big players in growing markets. Both have far more scale today than they did a decade ago. BKNG Gross Profit Margin (TTM) data by YCharts. Booking Holdings has done a phenomenal job at using its scale to drive operating leverage. When combined with its huge revenue growth, it is understandable why its stock is up more than 2,300% over the past decade. The opposite is true with First Solar. Its margins have all consistently trended downward. 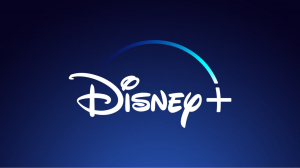 This indicates that the company is being forced to grant pricing concessions in order to win new business. While pursuing that strategy has translated into increased revenue growth, it hasn't benefited investors much. First Solar's stock has actually declined by more than 60% over the last decade. Great businesses create value. Bad businesses destroy value. One way that I check to see whether or not a company is creating value is by looking at its return on equity, return on assets, and return on invested capital over time. If these figures are high, then it is a great indicator that it is creating value as it grows. If the numbers are in the low single digits or negative for extended periods of time, then it is a sign that the business is destroying value and isn't worth investing in. 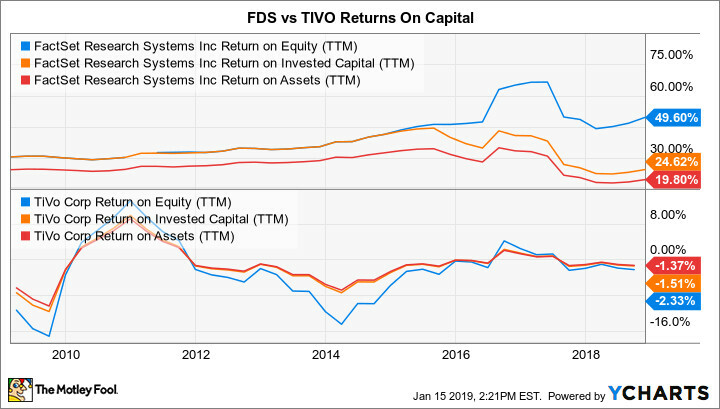 FDS Return on Equity (TTM) data by YCharts. FactSet does a great job at generating strong returns on capital each and every year. TiVo's return metrics have gone up and down over time, and they are all currently negative. This tells me that when FactSet reinvests into its core business, it creates a lot of shareholder value. 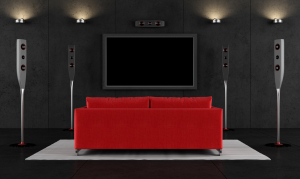 TiVo's numbers suggest that it is just a value-destroying machine. Stock-based compensation is a tool that many growth companies use to reward and retain employees. This is especially true in the fast-moving tech sector, where attracting top-tier engineering and executive talent is crucial. A side effect of issuing a lot of stock-based compensation is that investors are constantly being diluted. While some dilution is perfectly acceptable, I like to know just how bad it is before I take a position in a stock. Conversely, some highly profitable companies buy back their stock in huge amounts over time. This can lead to a shrinking share count, which can greatly benefit investors. 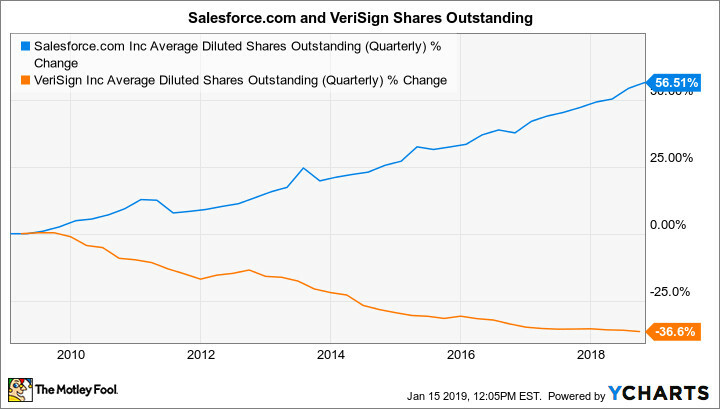 Take a look at two uber-successful tech companies: software-as-a-service pioneer salesforce.com and registry services provider VeriSign (NASDAQ: VRSN). 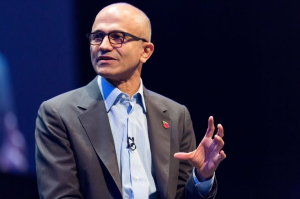 Salesforce is well known for being very generous with issuing stock-based compensation. VeriSign has been plowing all of its profits into stock buybacks for years. CRM Average Diluted Shares Outstanding (Quarterly) data by YCharts. Salesforce shareholders have been diluted by more than 50% over the last decade. Long-term VeriSign shareholders now own a higher percentage of the business than they did a decade ago. It is worth pointing out that high levels of dilution do not automatically disqualify a company from being a good investment. Salesforce's growth has been so fantastic over this time period that investors have still made out like bandits even with the huge dilution. However, I still believe that looking at this chart can be highly informative for investors. I don't think that these five charts alone provide enough data for investors to make decisions. That's why they are just a part of the checklist that I use to judge whether or not a business is worth considering. But I'm very confident that these five charts can be very useful in helping investors to pick better stocks. Brian Feroldi owns shares of Booking Holdings, FactSet Research Systems, Mastercard, and Netflix. The Motley Fool owns shares of and recommends Booking Holdings, FactSet Research Systems, Mastercard, Netflix, and Salesforce.com. The Motley Fool recommends First Solar. The Motley Fool has a disclosure policy.